The early outlook on the Nexus One—just 20,000 sold in its first week—hasn't gotten any better. After a month on the market, Google's moved just 80,000 phones. Compare that to the original iPhone and Droid launches. The relative sales results, shown above and using estimates by Flurry Analytics, aren't pretty for Google. Granted, it's not an entirely fair comparison. 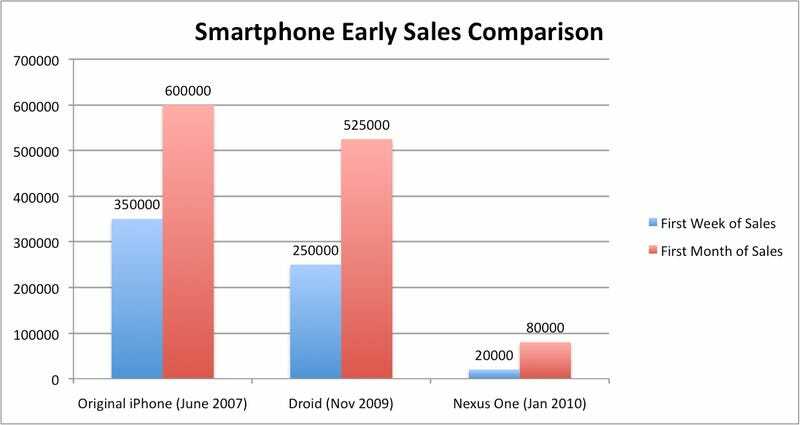 Droid and the iPhone were marketed within an inch of their lives, and had better carrier support than the Nexus One does on T-Mobile. But even taking that into consideration, 80,000 phones in a month? That's borderline embarrassing.